Kick off spring and celebrate Easter weekend with a unique 5k experience running through the award winning Augustine Golf Course! The 5k will start on Saturday, March 31 at 8:00 am.You will run along the cart paths and explore our scenic, beautifully manicured back 9 holes of the golf course. The race will finish back at the clubhouse where you will enjoy a full service bar and grille for a post race celebration. 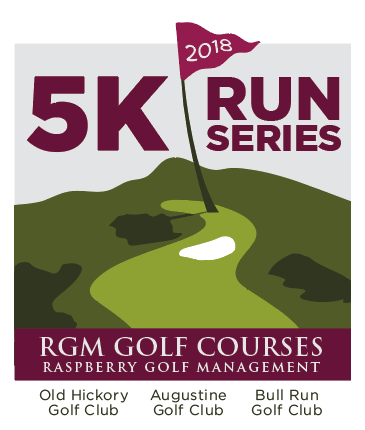 The Augustine Golf Club 5k is the second in a new series of three unique 5k races on Northern Virginia's most beautiful Raspberry Golf Management golf courses. PACKET PICK UP will be held at the Augustine Golf Course, 76 Monument Dr. Stafford, VA, 22554, on Friday, March 30 from 10:00am - 7:00 pm and again race morning starting at 7:00 am. Participants will receive a commemorative race shirt. Please register by March 15 to be guaranteed a shirt.